For the Jewish nation, thousands of years have been spent in counting down to a time period that will ultimately usher in the final redemption. A special clock, known as the Messiah clock, has been counting down the final arrival of the Messiah for the last 200 years, giving hope and inspiration to generations of Jews during turbulent times. The creator of the Messiah clock was none other than Rabbi Eliyahu of Vilna, also known as the Vilna Gaon, an 18th century Judaic scholar who was considered to be the guiding light of his generation, and is revered to this day. The Vilna Gaon spent much of his life studying Jewish concepts about the Messiah and yearned to move to Israel to hasten the process of redemption. Well versed in mathematics and astronomy, the Vilna Gaon used his secular and religious scholarly background to come up with a unique method of tracking time based on the Hebrew calendar and a combination of Jewish sources found in the Talmud (Sanhedrin 97a). Based on his specific calculations, the Messiah clock was created and has been slowly ticking down towards his ultimate arrival. The clock is based on the six days of creation, with each day corresponding to 1,000 years on the Hebrew calendar. The Vilna Gaon centered his calculations around the Jewish tradition that the Messiah must arrive by the year 6000 in the Jewish calendar, which corresponds to the day before the Sabbath and God’s refrain from any work. Currently, the Jewish calendar year is 5775. Comparing days from the story of creation to millennial periods of time is consistent with the Bible, which often has different measures of time correspond to one another. A cycle based on seven is used frequently in the Bible, such as in the concept of the Sabbatical year (Leviticus 25:3), the seven year agricultural cycle, and its extension, the Jubilee year (Leviticus 25:10), that occurs at the end of seven Sabbatical cycles. A Hebrew slave is also released after seven years of servitude (Exodus 21:2). The verse found at the end of each day in the story of the creation of the world in Genesis, “And there was evening and there was morning”, is the basis for the Jewish custom of beginning each day at sunset. The first day of the new week begins at sundown at the end of the Sabbath, the second day begins the following sunset, and so on. Further, according to Jewish law, each day is divided into two equal halves – night and daylight. Each half is then divided into 12 equal sections, with each section being one hour. From sunset to sunset, 24 hours of the day are divided up. Applying the Jewish concept of time with the understanding gleaned by the Vilna Gaon towards redemption, one full day is 1,000 years. 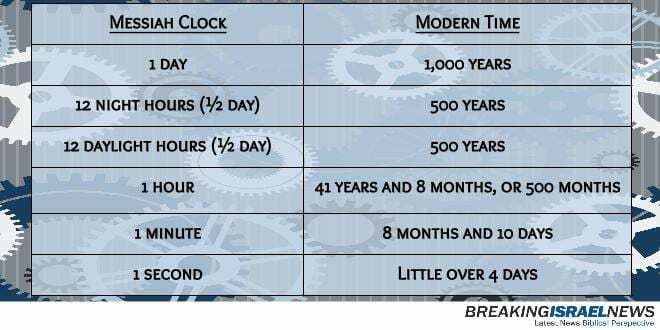 Therefore, one 12 hour night period equals 500 years and one 12 hour daylight period equals 500 years. If we further divide 1,000 by 24 hours, then each hour on the Messiah clock equals 41 years and eight months, or exactly 500 months. In calculating minutes, 500 months (one hour on the ‘creation clock’) is divided by sixty minutes. According to the Vilna Gaon’s clock, each minute is equal to 8.333 months, or eight months and ten days. For those who appreciate a challenge, one second on the ‘creation clock’ is a little over four days. Based on the days of creation, Friday, the sixth day of the week, comes after five full days, or 5,000 years on the clock. Friday night is half of one day on the Jewish calendar, so according to Vilna Gaon’s calculations, one night equals five hundred years. Friday morning at sunrise would be the year 5500 according to the Hebrew calendar or 1739 according to the Gregorian calendar. Based on this model, noon on the sixth day of the clock is 5750 in the Hebrew calendar, or 1990 according to the Gregorian calendar, marking three-quarters of the sixth day. That leaves six hours from Friday afternoon until sunset, when the Sabbath begins. If we use the Messiah clock to figure out “what time it is now”, the beginning of current Hebrew calendar year was exactly 12:36 pm. 12:37pm began on the 10th of Iyyar, 5775, or the April 29,2015. The Zohar states that just as Friday afternoon is entirely given over to preparations for the Sabbath, thus the time leading up to the 7000th year will be for preparing for the Messiah. By applying certain calculations based on Jewish law and tradition, the Vilna Gaon’s 7000 year clock can be used to make assertions about the process of redemption. Currently, based on the time of the Messiah clock, the year 6000 will occur in 2239 of the Gregorian calendar, indicating that the Messiah must arrive before then. It should be noted that a basic tenet of Jewish faith, based on the teachings of Maimonides, is that the Messiah can arrive at any moment. 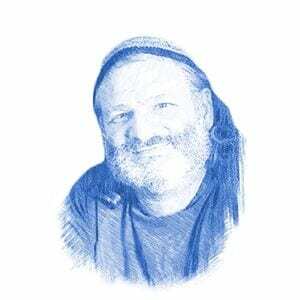 For Jews, the Messiah’s coming is always imminent. The Vilna Gaon’s calculations represent the last possible time the Messiah can arrive and, as we pray each day, he comes well before.